Sailing is a life-long sport that allows participants to get involved and achieve success at just about any age. As one learns to sail, they create a true connection to nature, and often the elements of nature – wind and waves – are harder on sailors than their fellow competitors. Nature demands a certain amount of respect from sailors, but for years sailing events have felt that by utilizing the wind for movement, they were being environmentally conscious sport. 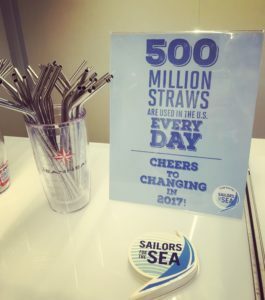 But when you look at the details of how the sport operates, you begin to see many ways sailors can change their behavior and give back to the waters that bring them so much joy. 10 years ago, Sailors for the Sea started the Clean Regattas program – the only sustainability certification for water-based events. It is a hybrid model of sustainability based on the ISO 20121 standard for Event Sustainability Management; the ISO 14000 standard for Environmental Management; and the Global Reporting Index (GRI) Event Organizers Sustainability Guidelines. But to make those big words accessible for overburdened volunteers who often run sailing events, we simplified the concepts into Best Practices and provided checklists to allow regatta organizers to achieve Bronze, Silver, Gold, and Platinum levels. Over time, the program has evolved and become more streamlined, and today it has 25 Best Practices with specific guidelines, such as a minimum of 7 to meet Bronze level, and a requirement of composting and public engagement at the Gold level. The Clean Regattas program instills the concept to “Play Greener” throughout the sailing community. The introduction of the program to an event often starts with just one individual. As planning begins, the influence expands as a green team is formed. The green team, which can range in size from 2 to 250 people, is trained in the sustainability efforts – often helping sort trash, recycling, and composting; helping refill water bottles; or creating emergency plans for oil spills. Every athlete at the event is engaged in the sustainability initiatives, as they are embedded in the event planning and management. Spectators or fans also partake in the Clean Regattas program when watching from a boat or onshore. events and 42,256 people in 32 US States and 31 countries and territories.